Are you ready for the truth about professional beauty brands and how it’s affecting the industry? Have you been following my “Evolution of the Beauty Industry“? This series has been in the making for quite sometime and I finally decided to take the plunge and get it out!! If you are in the professional beauty industry, do you feel the shift? If you aren’t then you will soon, because this is the biggest shift we have seen and things are changing fast. So are you positioning yourself to stay ahead? Diversion is actually the first topic that I’m covering because it’s one of the biggest disrupters! It’s important to know the history of the beauty industry to try to understand how it has changed, and those of us that have been around for awhile have witnessed a lot of this first hand. In my Facebook Live video below, I explain how professional products came about, as well as my take on diversion. Yes, I said the dreaded “D” word! Let’s face it, diversion is one of the most talked about subjects I see among pros. Who controls the beauty market? In my live Facebook video I also talked about the importance of knowing who owns popular brands, and it turns out that 182 beauty companies fall under the massive umbrellas of seven huge manufacturers. Thank you INSIDER for the following information. They created an infographic that illustrates all the major beauty brands and the parent companies that they fall under. They are great visuals. This usually comes to a shock to pro out there. But when you realize who owns the brands, do you really think it’s diversion? Estée Lauder Companies, L’Oréal, Unilever, Procter and Gamble, Shiseido, Johnson and Johnson, and Coty employ thousands of people around the world and make billions of dollars in revenue every year. They also are responsible for controlling advertising and the way we all think about beauty every day. 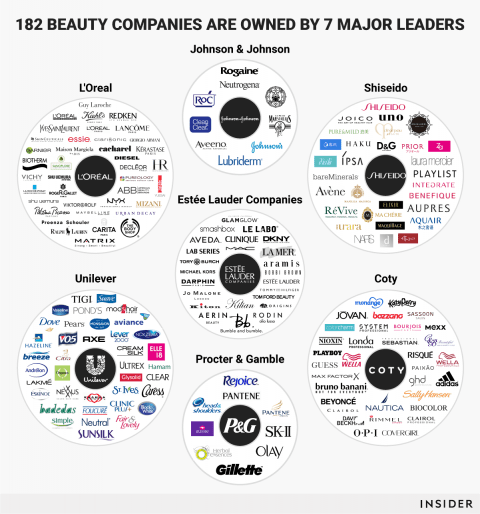 Each of these seven conglomerates has more than just the sub-brands listed here, but INSIDER chose to stick with brands that are responsible for skin care (for both the body and face), hair care, perfume, and makeup. They did not include brands that only made products such as deodorant, toothpaste, suntan lotion, or baby lotion, but did count the sub-brands of relevant brands (i.e. Pantene and Pantene Pro-V). What remains is a compelling look at who controls the beauty products we’re buying, from fan-favorites like CoverGirl to expensive and aspirational skincare lines like La Mer. And it’s mind-boggling to see how interconnected consumer brands truly are. L’Oréal had the most brands on this list with a total of 39 beauty brands, including major staples like Lancôme, Maybelline, Urban Decay, Garner, Essie, and The Body Shop. Many of their brands are staples in drugstores in the US, including Nexxus, Ponds, TIGI, Dove, Vaseline, and Lever 2000. Unilever also has quite a few brands popular outside the US, including Fair & Lovely, a “fairness cream” that’s marketed in India as a skin-lightening lotion for women. It’s worth noting that it has received backlash for promoting one shade of skin as better than another. After acquiring many brands from Procter & Gamble, Coty now owns numerous big name products, including OPI, Rimmel, Covergirl, and is behind celebrity toiletries like Katy Perry, David Beckham, and Beyoncé, among others. Shiseido — itself a well-known skincare brand — has about 30 other beauty brands underneath it. Some of those are also makeup brands, including bareMinerals, Nars, and Laura Mercier. The vast majority are brands that might not be recognized in the US, including Japanese brands such as Majolica Majorca, Ettusais, Maquillage, and Aqua Label, which also claims to “whiten” skin. The company also made quite a bit of money in skincare — $7.1 billion in 2016 to be exact, according to Beauty Packaging. I know that there have been even more buyouts and acquisitions since INSIDER put together this list, but things are moving so fast, it is hard to keep up! Why is all of the above relevant? Do you really think that these BIG corporations are loyal to professional accounts? Do you think that diversion is all due to the illegal sale of products? These manufacturers don’t need professionals anymore!! Their business plan is to buy up all of the “branded”, successful brands and then bypass the pros and go directly to the consumer. Their goal is to be THE BIGGEST beauty brand in the world, and more sales is the only way. I get it! It’s frustrating!! I know, I get it. And I know that you are considering giving up retailing altogether as all of your brands are jumping ship. But DON’T give up!! There are ways to stay ahead!! Make sure to tune into my LIVE video next week as I continue with Distribution. It will tie all of this together with the way that our products get to the end consumer, and I’m not going to lie…it’s pretty eye opening! Just know that there’s a reason for me sharing all of this, and there are things that you can do to avoid your clients going to AMAZON and the other online stores to get the products you have promoted to them. Hang in there!! Oh, and if you didn’t catch my live Facebook broadcast on Diversion, watch below 🙂 And follow mw on Facebook so you can catch them LIVE!! I want to hear from you, are you shocked by who owns what?